Avtomat Kalashnikova 1947, better known as the AK-47, is easily the most recognizable and, unfortunately, most widely produced and distributed assault rifle in the world. Designed in Russia in the aftermath of World War II, it was meant to put the most firepower possible into the hands of as many Soviet soldiers as possible, as quickly and inexpensively as possible–the technical response to the enormous casualties sustained by the Soviet Union on the Eastern Front. As a weapon of war it has many virtues –it is cheap to produce, easy to operate, almost incredibly durable, and, thanks to the simplicity of its design, very easy to manufacture. The design was never patented and it has been produced freely by many countries, in enormous numbers. It fires a powerful 7.62mm round –a caliber widely and easily available –and all of these factors have combined to make it the single most widely produced assault rifle of all time, with an estimated 100 million or more having been produced since Mikhail Kalashnikov’s design first went into production. Unfortunately these are also the properties that have put it into millions of hands and made it incredibly cheap and easy to obtain –especially in Africa, where a large supply of both Russian made and knockoff designs have flooded in over the decades, and where porous borders make the traffic in Kalashnikovs both easy and frighteningly low cost. In 2009, Reuters reported a price list for weapons in Somalia –a knockoff AK-47 could be had for as little as $140. Removing these weapons from African war zones, where they’ve exacted a horrifying toll, is the mission of Fonderie 47, which was founded in 2011 in New York by Peter Thun, the former president of Ethos Water. Fonderie 47 works with the UK based NGO, Mines Advisory Group, to fund the purchase and destruction of assault rifles in Africa (it’s estimated that there are around 20 million assault rifles in Africa –the vast majority AK-47s and their variants.) Fonderie 47 takes a portion of the metal recovered from scrapped assault rifles and transforms it into components in beautiful pieces of jewelry and other craft objects –and, for the first time, they’ve created a watch, with award-winning watchmaker David Candaux, famous for his work with Jaeger LeCoultre on the Hybris Mechanica series of watches, and now an independent watchmaker and designer. 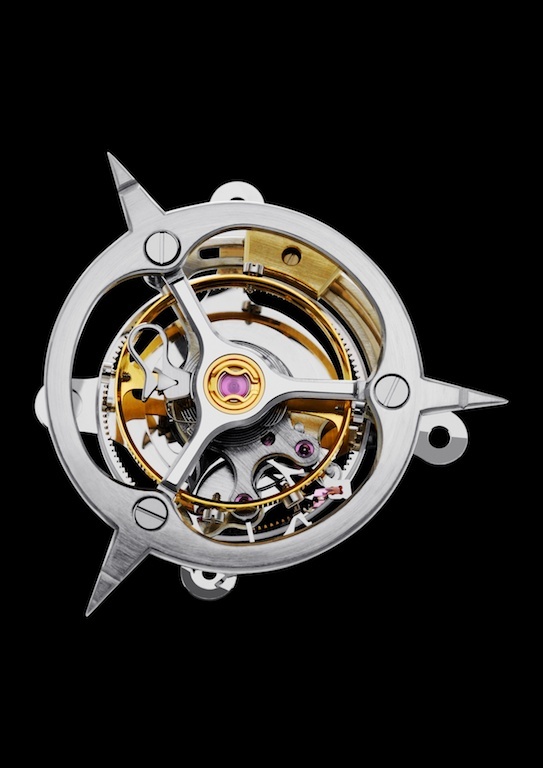 The watch is an object as remarkable as its mission: the Inversion Principle Tourbillon is a three minute, central tourbillon, with an instantaneous jumping hours display (settable with a quickset pusher) a retrograde minutes display, and two power reserve indicators –one in the case-band, and one on the back of the watch; it has a six day power reserve. 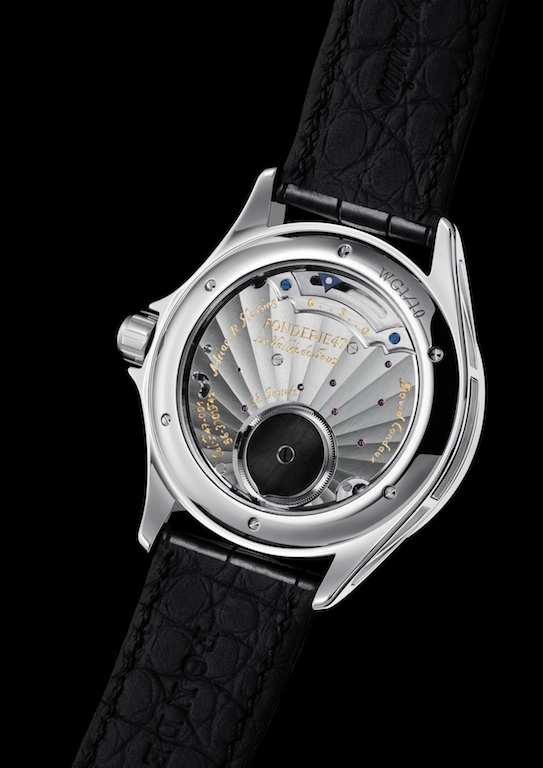 The objective in creating the watch was twofold: first, of course, to make an aesthetically and technically remarkable watch, and second, to organize the design in such a way as to create a subtle connection to the concept of transforming an instrument of war into a precision instrument of timekeeping –but in a subtle fashion whose intelligence reflects the magnitude of the humanitarian crisis created by easily available high powered assault rifles. 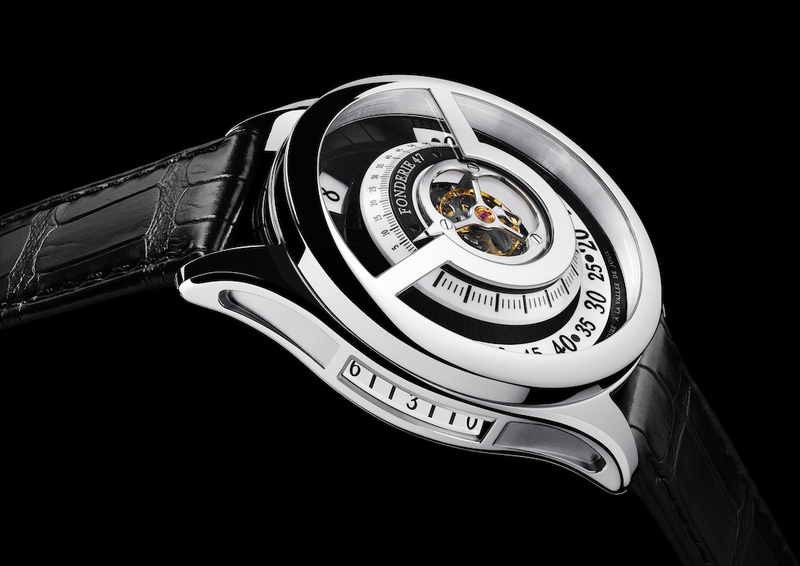 The three minute tourbillon, for instance, tells the seconds as it rotates via one of three hands crossing an arc of 120 degrees, while the other two hands are hidden –it is not obvious at all but the shape of the white gold bridge that hides two of the three hands at any given time is inspired by the notch-and-post design of a gunsight. On the back a dark plate of steel from a destroyed AK-47 caps the ratchet wheel, with a sunray guilloché pattern radiating outwards from it. The lateral power reserve display is likewise a carefully nuanced reference to the AK-47 –it was inspired by the ejection port for spent rounds. In association with designer Adrian Glessing, Fonderie 47 and David Candaux have created a timepiece with a mission: making a dangerous world just a little bit safer. 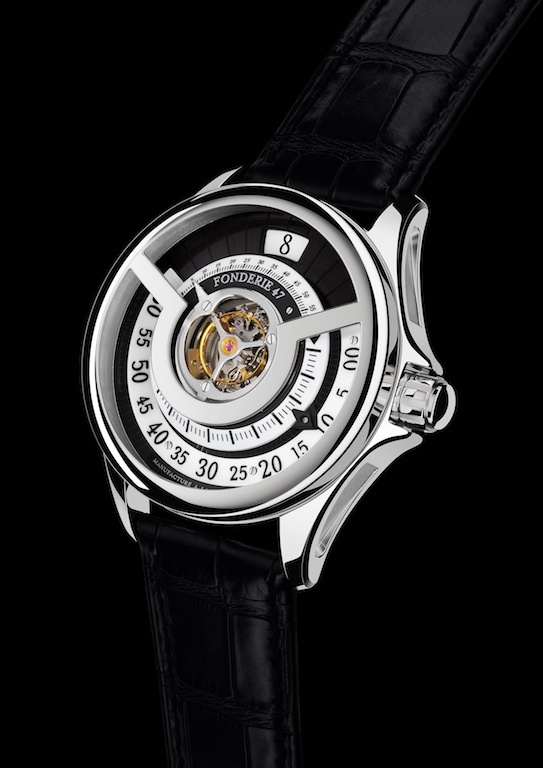 The Inversion Principle Tourbillon by Fonderie 47 is a limited edition of 20 pieces, 10 in white gold, and 10 in red gold. Diameter, 42mm; 3 minute central tourbillon with jumping hours and double power reserve display; power reserve of 60 hours. $350,000; the sale of each watch funds the destruction of 1,000 assault rifles in Africa. For availability and more information, visit www.fonderie47.com.